Avinashilingam Engineering Entrance Exam is conducted for admission to undergraduate and postgraduate engineering programs such as Biomedical Instrumentation Engineering, Civil Engineering, Computer Science and Engineering, Electronics and Communication Engineering, Food Processing and Preservation Technology, Printing Technology, Medical Electronics, Computer Science and Engineering, VLSI Design, Food Technology. Candidates who have completed 10+2 or are appearing in can apply for Avinashilingam Engineering Entrance Exam 2019 by downloading the application form from avinuty.ac.in. 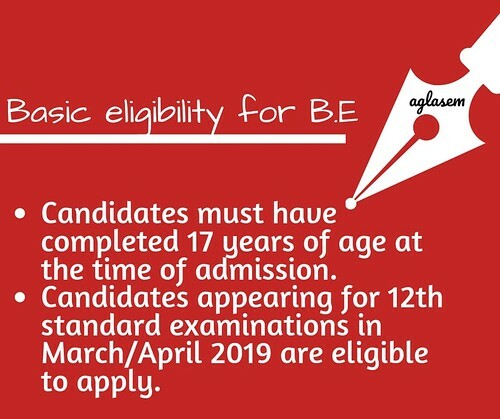 Read the complete article to get detailed information regarding Avinashilingam Engineering Entrance Exam 2019. Latest: Result for Avinashilingam Engineering Entrance Exam 2019 is resleased. Scroll down to check the same. The Avinashilingam University released the application form regarding the admissions for B.E., M.E. 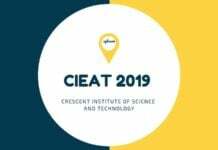 admission through AEEE 2019. The candidates who are seeking admission in Avinashilingam University may note that being eligible and getting merit is the only means of admission. Likely dates for the exam are as given in the table below. The announcement of the Avinashilingam Engineering Entrance Exam 2019 result is now available online on the official website of the University. Candidates will not be sent the result card by post. The candidates who appear for the test is now able to check their result given in pdf form only from the website. Candidates can also download the same from the link that is provided below. Result: Click here to check the result for Avinashilingam Engineering Entrance Exam 2019. The Avinashilingam Engineering Entrance Exam 2019 Application Form has been released. Candidates can check the same at the official website www.avinuty.ac.in. Candidates can go through details of the application form and read the prospectus. Application forms and prospectus is available at the office of Avinashilingam Institute for Home Science and Higher Education for Women, Coimbatore – 641 043 on payment of Rs. 400/- by cash or by post by sending a request to the Registrar along with a DD for Rs. 450/-(For SC/ST students only Rs. 200/- by cash or Rs. 250/- by post on producing the attested copy of community certificate) drawn in favour of The Registrar, Avinashilingam Institute for Home Science and Higher Education for Women, payable at Coimbatore, or can be downloaded from the website www.avinuty.ac.in. The direct link to fill and download the application form is given below. Download Application Form: Click here to download the application form for Avinashilingam Engineering Entrance Exam 2019. Application form duly filled in, by the candidate’s own handwriting, with the attested copies of 10th Mark Sheet and Community Certificate, should reach the Registrar, Avinashilingam Institute for Home Science and Higher Education for Women, Coimbatore – 641 043. Avinashilingam Engineering Entrance Exam eligibility criteria is given below. Candidates willing to apply must go through the eligibility before applying. Passed 10+2 examination with Physics and Mathematics as compulsory subjects along with Chemistry / Biotechnology / Biology / Technical Vocational. Obtained at least 45% marks (40% in case of candidates belonging to reserved category) in the above subjects taken together. Bachelors’ degree or equivalent in the relevant field with at least 50% marks (45% in case of candidate belonging to reserved category) at the qualifying Examination. Those who are awaiting the results of their qualifying examinations will also be eligible to apply. The candidates should compulsorily produce their mark sheets at the time of interview. The Admit Card will be issued for only those candidates who submit their application form with fee. Candidates can download admit card from the University’s official website only and availability of admit card will not be made through offline mode to candidates. The link to download admit card for the Avinashilingam Engineering Entrance Exam 2019 will be updated here. The venue for the Entrance Examination: Avinashilingam Institute For Home Science and Higher Education For Women, Bharathi Park Road (Opp. To TVS), North Coimbatore – 641043. (Campus – l). Course wise fee structure for Avinashilingam entrance exam is given below. Candidates may check it. 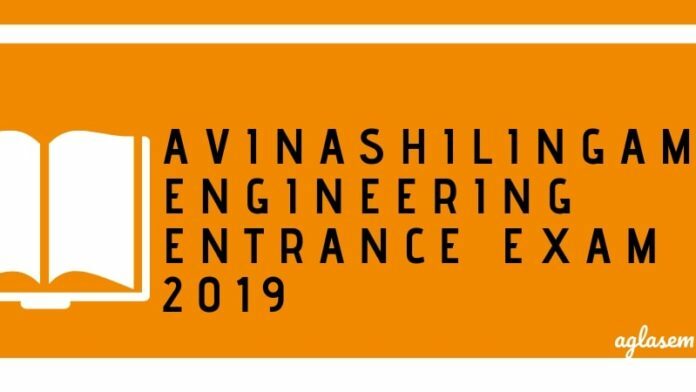 For more details of the Avinashilingam Engineering Entrance Exam 2019 – Download Information Brochure.